The unique identity of a city has many origins, from the cultural and political to the historic and geographic. But perhaps the most basic defining characteristic of cities and the regions they anchor is how they are physically built, both outward and upward. ‘Sprawl’ has long been a popular way to describe the dominant growth pattern in the U.S., where regions extend away from their core urban areas into low-density suburbs. While town has always expanded into country, the sheer intensity with which American cities have done so can be traced back to the historical circumstances of the postwar era. The construction of the interstate highway system coupled with cheap energy made long-distance commuting convenient and accessible. Economic and social turmoil in central cities—aided by a web of overtly racist, exclusionary housing policies—drove millions away from urban cores. Low-interest mortgages became the new normal, through both government-backed private lenders and the generous terms of the 1944 GI Bill. 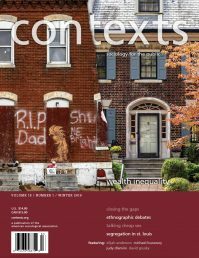 Though their influence is harder to measure, shifting cultural attitudes were also doubtlessly important, as broad economic growth permitted families to migrate from cramped tenements after the hardship of depressions and world wars. Whatever its causes, sprawl has fundamentally reshaped our urban landscape and continues to have an outsized effect on life in America. The most straightforward result of people spreading out in single-family homes instead of clustered together in urban cores is how people transport themselves. Because residents of places like Atlanta and Charlotte are far more spread out than those in New York or Los Angeles (see Figure 1), they likewise have to drive more often and for longer distances. This in turn generates more hazardous pollution and carbon dioxide, which directly contribute to environmental problems like smog and climate change. Yet the same ability to commute long distances that generates sprawl also allows for more inexpensive development on the urban outskirts. Residents can make a trade-off of spending more time and money on transportation in exchange for cheaper housing. This trade-off raises some important questions—namely, what is sprawl’s relationship with energy use and affordability in America today? And looking to the future, how can we grow more compact and efficiently on the one hand, while remaining accessible on the other? While almost any metropolitan region in the U.S. would be considered sprawling compared to those in Europe or Asia, some are more spread out than others. Older cities in the northeast corridor from Boston to Washington tend to be more compact, and house higher numbers of people in multifamily dwellings. This is partly because these cities matured at a historical time when streetcars and even horses were the only ways of getting around. In the west, geography often corresponds to denser development because mountains and deserts prevent urban regions from expanding outward. 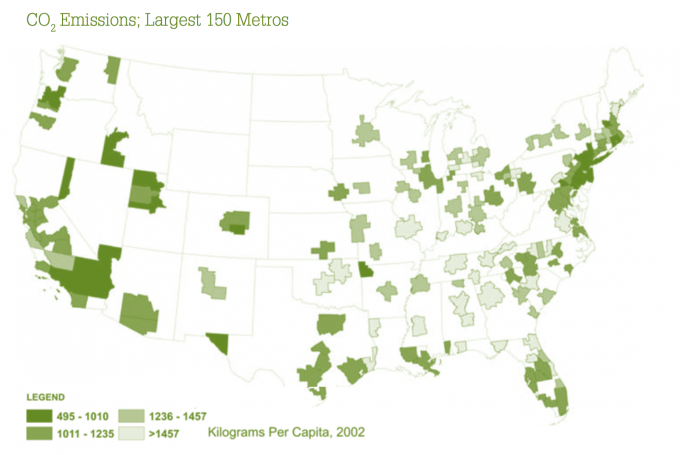 The most sprawled regions in the U.S. are the Midwest and South, but particularly the Southeast (see Figure 2). Today, most places continue to sprawl over time because either their suburbs are growing faster than their cities, or because they hollow out as their economic fortunes wane. Looking at carbon dioxide emissions—the main driver of climate change—areas that sprawl the most also unsurprisingly tend to produce more pollutants per person (see Figure 3). Based on 2002 emissions data from the Vulcan Project at Arizona State, for example, Atlanta had nearly twice the automobile carbon emissions per person than New York. 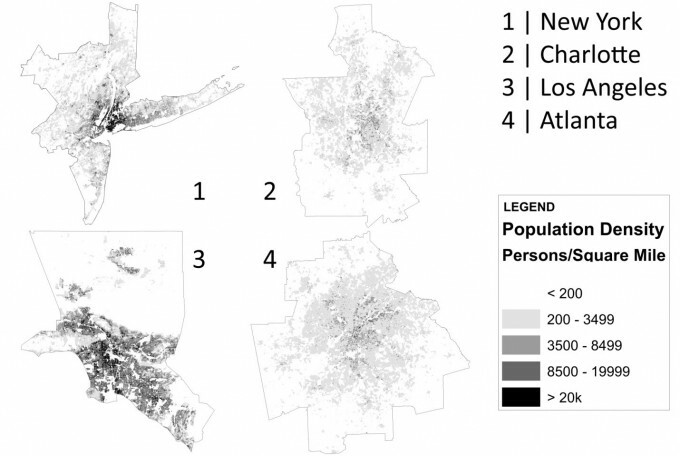 Atlanta’s sprawling layout requires residents to drive more often and farther distances to get around than New Yorkers who can often walk or take public transportation to their destinations. The script flips for housing costs, with average New York home values at twice that of Atlanta homes. (see Figure 4). While the cost of living overall is not radically different in more sprawled regions because of higher transportation expenses, home values are a crucially important factor in urban affordability. The largest source of wealth by far for most Americans is their home equity. So even if, say, a new car, insurance, and gas offset the savings of cheap housing, for many people places like Atlanta are still attractive because they can buy homes more quickly and easily. Cheap, convenient transportation like that in New York is critically important for job access and quality of life. However, if housing is out of reach, it’s easy to see why many may choose a city like Atlanta instead. The comparative affordability of sprawled cities has two important potential implications. One is that sprawl intensifies more than it otherwise would as people seek out reasonable costs of living, either on the regional outskirts of their cities or in cheaper metros altogether. Another is growing economic inequality among metros, where people are increasingly sorted into either poorer (sprawled) or richer (compact) regions based on their ability to meet these costs. Resolving the tension between efficiency and affordability can help avoid these outcomes. Building up instead of out in sprawling regions could begin with more meaningful planning and coordination at all levels of government. Growth boundaries are tools long used by places like Portland and Seattle to prohibit development past a defined area. Recent research by Kurt Paulsen in a 2013 issue of Land Economics suggests that these policies are effective when they are carefully applied. Regional coordination prevents the unintended consequence of people ‘spilling over’ into outlying regions. Strong state-level regulation likewise prevents developers from pitting metros against one another in a zero-sum game of attracting construction. Transportation-wise, investing in new infrastructure can make traveling more efficient while also spurring dense residential construction. Yet this is increasingly difficult, as federal transportation spending has plummeted over the past three decades. This leaves states and municipalities picking up the costs, often imposing regressive or unpopular sales or property taxes just to keep their transit authorities afloat. Much like transportation, the federal government’s role in housing has sharply declined in the wake of the widespread failure of public projects. The largest government housing subsidy by far is the mortgage interest deduction. Most homeowners don’t benefit from itemizing their tax returns, so this mainly benefits wealthier people who would probably own homes regardless. Though even many conservatives support repeal or reform of the credit, its popularity with voters makes this difficult. The Low-Income Housing Tax Credit is currently the main vehicle for promoting affordable multi-unit construction. This works by offering developers tradable tax credits for setting aside a portion of new construction for lower-income people. Yet while it has successfully produced millions of affordable units since its inception in the mid-80s, it also relies on arbitrary income eligibility guidelines and only applies to renters. Moreover, affordable units often transition to market rate after a predetermined length of time. Regardless of the specific policy, it will be difficult to reconcile efficiency and affordability city by city. Regional coordination and even intervention at the federal level can deliver the resources and vision necessary to chart a path forward for American cities and their surrounding metropolitan regions, whatever form it may take. By most measures, urban areas are still sprawling as they are built out or as their large cities depopulate. Others grow more disproportionately expensive, leaving their residents in the difficult position of keeping up. Paying attention to this urban divide will help avoid vibrant, transit rich, sustainable development from becoming a luxury good rather than something we customarily expect from the places we call home. Thomas Laidley is a doctoral candidate in sociology at New York University. He studies ecology, stratification, and urban sociology.